This weekend was the 55th Rattlesnake roundup in Morris, Pa. We went on Saturday and it was hot 90 degrees and humid. I am sure the snakes weren't liking the weather anymore than the people. The largest snake they had caught was 53" and is the one in the video with Lee. She said it was very heavy when the guy let some of the weight into her hand. The snakes are micro-chipped and released back were they were caught since they are protected. The Timber rattles for the most part are one of the most docile of the rattlesnakes, generally trying to stay away from people. The event last two days and they give prizes out for the biggest yellow and the biggest black timber rattler as well as the biggest snake. The kids at the event always get a kick out of seeing the snakes. People who are afraid of the snakes usually stay away. I know my daughter wouldn't go within a hundred miles of any snake. This sign was posted on the Watrous Bridge two days ago. A supporter of the gas well exploration contributed a little old time Burma Shave rhyme to the conflict between pro and con. Although, the last part probably doesn't apply to the people who oppose it the most...the ones who aren't getting any royalties and have to deal with the mess. 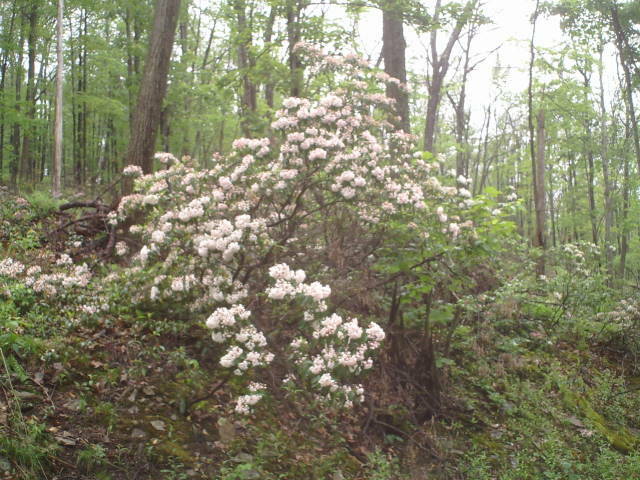 On a lighter note I posted some pictures of the mountain laurel blooming on top of Cedar Mountain. Now is the time to get out and see it. I am thinking it may be past its prime by the time of the Laurel festival. Guess the contrast between beauty and development will continue. The best remedy is to soak up the beauty. Lee has sixteen feeders up. It is very difficult to get them to cooperate with being filmed, but here is a small taste. The sound you hear in the background is rain dropping on a piece of tin. She fills the feeders each day and they buzz around like bottle rockets. They eat 50-60 times per day and can fly backwards...the only bird who can do this. They are feisty little birds often sparring with each other. They have even been know to chase eagles. The are able to go into a kind of hibernation at night to conserve energy and fly as much as 2500 miles south in the winter. Because of their incredible abilities they are known as a symbol of accomplishing that which seems impossible. Something we need to be reminded of a lot when trying to live in such a hard area as Leetonia to make a living. Mountain girl, Paula, logging out and accomplishing the impossible. Early in the morning it is common to see several large birds hanging out in a tree sunning themselves in the rising morning sun. The color of their feathers and size is similar to turkeys, but as you get closer you realize they are Turkey Vultures. 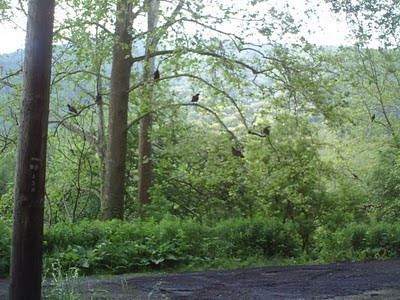 The soaring vultures are often mistaken for eagles down around Pine Creek. This could be because of their size. Vultures lay their eggs on the ground. It takes 3 months for the young to be able to fly. It is believed that when the Vulture returns in the Spring the danger of frost is over. It got down to 37 last night so the danger of that belief being erased got real close. Another early belief was that in the beginning of time the sun lived very close to the earth and the animals wanted to move the sun further away. The fox was the first to volunteer and grabbed the sun inside its mouth and began running away. The sun became too hot and burnt the inside of the fox's mouth. That is why the fox's mouth is black on the inside. Then the opossum volunteered and wrapped its tail around the sun and tried to carry it away. This is why there is no hair on the opossum's tail. Then the Vulture volunteered. The vulture was the most beautiful and powerful of all birds. Upon its head was a beautiful mantle of rich feathering that all birds envied. The vulture placed its head against the sun and pushed it away from the earth. The heat from the sun burnt the vulture's beautiful feathers off for all eternity. The information about the vulture was from Ted Andrew's Animal Speak book. Ted passed away October 24th, 2009 after a bout with cancer. He was taken too early but I am sure he is walking with the animals in spirit that he loved so much here on earth. Next time you see a vulture in the air may you now look at it a bit differently. Mountain girl, Paula, logging off. There is something special about the way sunlight filters through the trees of the forest. The harshness of the direct sunlight forms patterns on the road that can be almost hypnotizing at times as you wind around the mountains. Blue patches of sky show through the tops of the trees and it is always 10 degrees cooler than outside of the forest. This weekend the forest hosted the annual car rally. 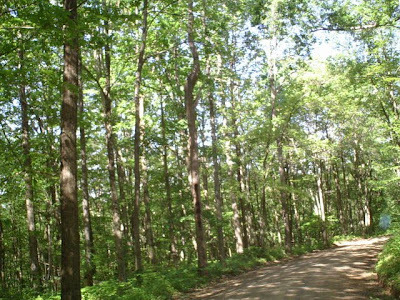 An event that draws more traffic into the forest then it sees then entire rest of the year. It usually rains for this event, but this year the rain held off until late Saturday when it rained lightly. Sunday morning it poured. The water turns a milky brown running down the roads when we get a fast heavy rain There is a delay in the water filling small streams, then to the larger streams and finally to Pine Creek. 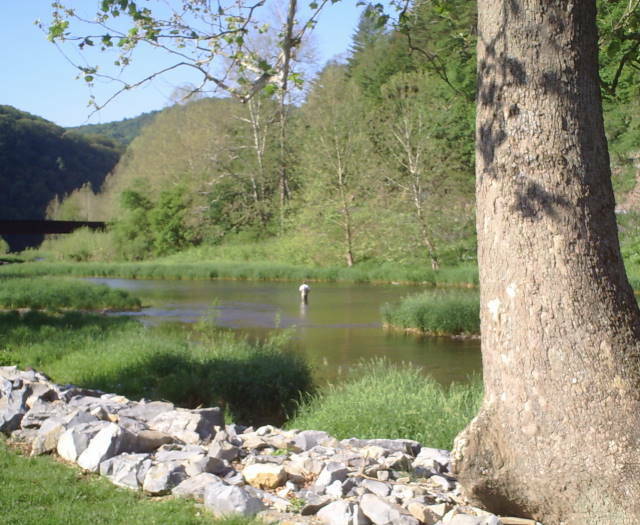 Pine Creek was at 1.6 ft before the rain this morning and by 3pm was up to1.9 and climbing. Sudden hard rains can leave people stranded in spots on Pine Creek they thought were low and easy to walk across when the water level makes it there. One person told me they had walked across Pine Creek and noticed the water starting to change color. By the time they realized the water level was rising it was too late to go back across. They ended up walking some distance to find a bridge to get back to the other side. 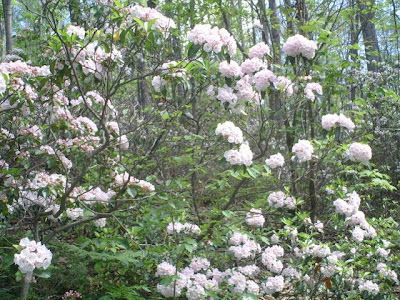 The Mountain Laurel is absolutely beautiful this year and I hope to get a few more pictures of it while it is in full bloom and color. It's not an every year event to have it this nice. If any of you get a chance to come up in the next couple weeks you will get a treat of color. In some places it almost looks like snow between the trees blooming so white. We had company over the weekend and spend a few days taking care of them and not working so tomorrow it is back to work to feed the mountain girls and their dogs. Mountain girl, Paula, logging off. The mountain laurel started blooming this last week and it looks like it is going to be real good on Cedar Mountain up from our house on Leetonia Rd. 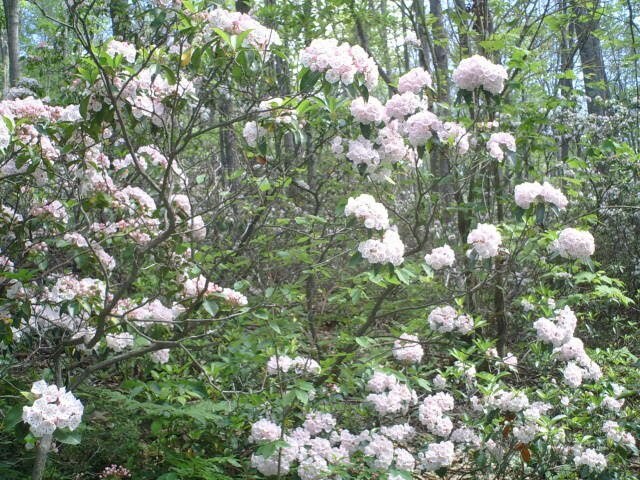 I am surprised it is doing so well after that hard freeze the first part of May. It seems a bit early so maybe it likes cold weather. The fisherman at Blackwell, took advantage of the low water and were wading out over the weekend. It was a bit hot and very buggy for Memorial weekend, but the rain held off allowing people plenty of time to have their memorial day picnics. There were a lot of people up to their camps enjoying some of the natural beauty of the area. The last picture I took while traveling around the woods on Francis Road just off Slate Run Rd. The bridge is closed a few miles down the road, and it is very bumpy with potholes, however the views made up for it. 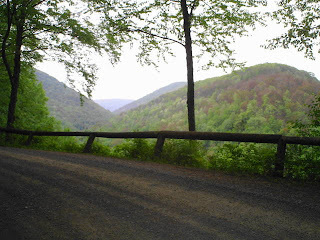 see the late freeze damage on the trees as you look down the valley. 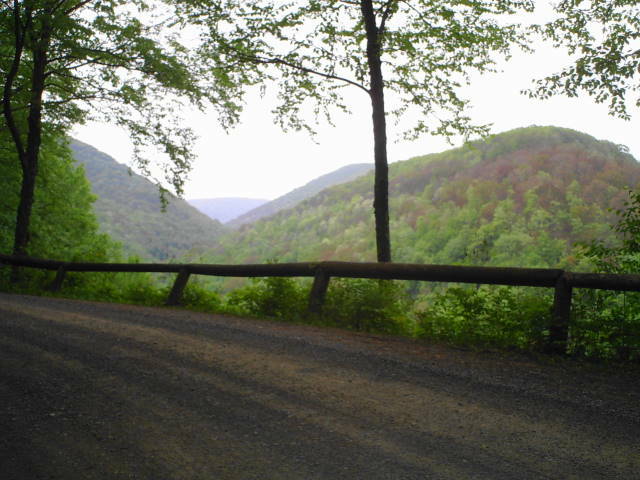 If you have never been down this road and don't mind bumps and turning around at the bridge it is a beautiful drive. I can thank the Census Bureau for funding my drive up there. I don't usually travel roads that have bridges out. It got a little dusty over the weekend with all the traffic of camp goers, but the rain has washed the air clean and it has that great forest smell today. Since the sun is staying under clouds it is also pleasant temperatures in the low 70's. Have a great Leetonia day! Mountain girl, Paula, logging out.